In our role as independent care advisors, we regularly work with people who are living with dementia and with the families of those people, so it is really important that we have as good an understanding as possible of what it is like living with dementia and the impact it has. 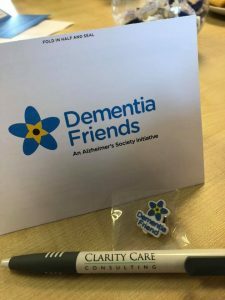 Some of the team at Clarity Care Consulting have been Dementia Friends for a number of years, but as part of our ongoing education, the whole team recently attended a Dementia Friends session that was being run by Driving Miss Daisy in their Portsmouth offices. 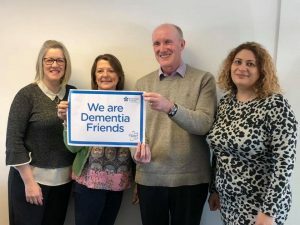 Driving Miss Daisy is an organisation we regularly work with to provide transport and companionship for our clients and they have become Dementia Champions, which means they are able to host Dementia Friends sessions. It was really good for all the team to have an opportunity to be reminded about some of the different types of dementia and how it affects both the people who are living with dementia but also their family and friends. The similes of fairy lights and bookshelves in relation to memories and feelings and the impact of dementia on these were very powerful but easy to understand, and it has been good to hear the team using these in conversations with our clients since we all became Dementia Friends. We are now planning to become Dementia Champions ourselves, so will be able to run our own Dementia Friends sessions. Dementia Friends is an Alzheimer’s Society initiative and over 2.5 million people have become dementia friends since it started. If you would like to know more about Dementia Friends and Champions, please visit the Dementia Friends website. If you know somebody who is living with dementia and you need help finding the right care for them, please call Clarity Care Consulting on 02392 251351 and speak to one of our independent care advisors who will be only too happy to help.